A couple of months ago, I created a project that had outgrown my regular loom bars and I had to buy brooms and cut them down for my beams. That project was a plain-weave piece of 2000 ends of 60/2 silk and supplemental weft for patterning. This week I find myself weaving with the same silk and my regular loom bars but, this time, my project is a mere half-inch wide. It may seem like overkill using those big sticks for such a tiny project. Many a time I have abandoned the sticks to pass cord through the end loops of the warp and tie that to my waist with the other end of the warp hooked to my big toe. No backstrap, no sticks…just fingers, a toe and string. However, I do prefer the stability of the sticks and I feel perfectly balanced and at home with what may look to others as a very cumbersome, clumsy and perhaps unnecessarily complex set-up. I think this backstrap weaver in Mexico feels the same way I do. I think her band may be even narrower than mine. The narrow band project is happening because I promised some lanyards for name tags for a friend. They need to be roughly 1/2 ” wide and 34” long. I have to admit that it is a nice change and break to be weaving these after having had so many large projects on my loom lately. I wanted to fit a lot of pattern into that mere half-inch space and so I used 60/2 silk. I wove an Andean Pebble Weave pattern. Because it is a complementary-warp structure with warp-floats on both faces, the band is dense enough to make a good lanyard. I chose a pattern that I have woven so so many times before, I can just about do it with my eyes shut. I was a bit put off by the impending boredom…34″ of a pattern that I already know so well and have woven in many color combinations. I wouldn’t experience the delight of seeing new shapes and forms appear or new color combinations. It was just going to be very, very slow going with the fine silk. So, I decided to set it up for loom-controlled patterning so I wouldn’t have to have my fingers in among the size 60/2 threads. Having it set up with a series of heddles to control all the pattern sheds would make this novel and interesting, not to mention fast! A few years ago, I wove this guitar strap for a friend. She was giving it as a birthday present and it had to mailed to the USA from Bolivia. I was on a deadline and had to move fast. I set up only two heddles in addition to the two pebble heddles to speed things up a bit. Part of the process was still weaver-controlled in that I was picking up some of the sheds by hand. I have five sets of heddles and a shed loop. This particular pattern has a couple of horizontal bars. I picked up the first horizontal bar by hand, stored it on a saver cord and used that cord to weave the second horizontal bar. Then I had to remove the cord. That is the only time I picked up by hand. I could have installed another set of heddles for that pick but didn’t want to clutter things up too much. This silk does tend to fluff and there is a lot of extra abrasion with sheds being cleared through all those heddles. The weaving went really fast and what I thought might be tedious was, in fact, a lot of fun. Now I am weaving a second lanyard with #10 crochet cotton. As the thread is heavier, there is less detail in the pattern…only 16 ends of pattern threads this time compared to 64 in the silk lanyard. I have installed more heddles for this one as this mercerized thread can take the abrasion better than the silk. This project has 7 sets of heddles with one pattern shed held in a loop. The colors of the heddles help me find my way in the sequence. It’s another pattern that I have woven many times and that I did not wish to pick up for 34”. I used it quite recently on my silk yurt-shaped pouch and accessories. It has gotten to the stage where I am not interested in weaving something unless there is some major learning to be had. This project will show me how well I can manage 7 sets of heddles and if the work of clearing sheds through multiple heddles makes this method worthwhile. It is not something that I am planning on adopting for my own weavings. I really do prefer getting my hands in there and doing the pick-up! I doubt you will be seeing me doing this any time soon! I will weave a couple more lanyards and see just how many sets of heddles I am willing to manage for other patterns. I have seen other pattern shed storage systems used by backstrap weaver in various places…sheds stored in multiple heddles and on sticks. Deb McClintock showed me how Laos weavers use a vertical shed storage system on their floor looms. She adapted the system to one of her own floor looms. Inspired by that, I have sometimes placed colored strings on my string heddles to help me lift threads for small repeating supplementary-weft patterns. The colored guide threads help me locate the spot where the pattern needs to be placed and gives me the first pick rather than having to count lots of fine warp ends. Here is a video that I took of Deb McClintock demonstrating the Laos pattern storage system. I have not had the chance to see how other backstrap weavers in Asia set up pattern storage systems. I have seen lots of sticks piled up on backstrap warps but have never seen them in use. An online weaving friend in Turkey, Adem, sent me a link to a very interesting video showing how a backstrap weaver uses those sticks. The video does not give information about the weaver but I believe, from having looked around online, that she may be a Karen weaver of Thailand or Myanmar. She mentions having brought thread with her from Thailand. There seem to be a few groups of Burmese weavers being formed in the USA where the ladies can come together, teach and support each other, practice their art and eventually sell their cloth. These are a couple of shots from a video made about a group of such weavers in Vermont at the Vermont Folklife Center. They show the pattern sticks in the warp between the shed rod and coil rod. Here is the video that Adem sent me. The weaver is using a simple warp-float technique with floats formed from the threads in one of the two basic sheds on only one face of the fabric. It is a very cool set-up! And so, I will be be playing with multiple heddles on my teeny tiny warps for a few days. If it is fun, I will make even more lanyards than I originally promised. In the meantime, the brown wool on which I had been waiting arrived and now I can plan and weave the edging for the brown wool panels that I recently finished. I finished the purple wool panel and have put that aside. It was tougher weaving the pattern on the purple piece than the ones I chose for the brown panel. A few factors made weaving the brown panel more enjoyable. Firstly, I used the Andean Pebble Weave structure on the brown panels which means that every second weft shot was through a loom-controlled shed. That speeds things up. Plus, I just love working those two sets of heddles. The fact that there are six different motifs made it a lot more interesting too. I was also weaving the narrow continuous pattern alongside the larger motifs for the first time. It was my own design which added extra interest. I used a supplementary-warp structure for the purple panel. I have never been a huge fan of this structure and, unfortunately, weaving this piece did not change the way I feel about it. I am not sure what it is…I just don’t like the way it feels. The motif was continuous and rather confusing with those hooks going this way and that but I like those kinds of pick-up challenges! I really want to wash this piece and see how things come together after the wet finishing. However, I dare not do that until I have the second matching panel completed. In any case, I am really pleased with the way it came out. It will be nice to have these two large wool pieces showing two different structures. I will weave more in this wool set representing other structures. I have quite a few lovely things to show from my online weaving friends but will leave them for next week. Instead, let me leave you with this gorgeous video of a song by Mapuche singer Anahi Mariluan sung in a mix of Spanish and the language of her people of southern Chile and Argentina. 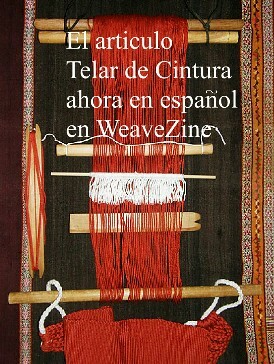 I am very grateful to my many Chilean and Argentinean online weaving friends who send me links to these beautiful things. The scenery of the south in this video is stunning and the song is so peaceful and delicate yet powerful. On the Youtube page for this video you can see the lyrics…. ” No Estamos Solas” – ”We are not Alone”. You can listen to more here. Great post! I love reading about your adventures. Thank you for sharing this beautiful song with us. It comes at a time when I really need it most. Last week I learned that my 11 year old son has cancer. I look forward to each posting of your beautiful work.